Let’s face it, when you think of a classic car with some outstanding technological features for the period and appeal for the entire family, Oldsmobile coupes are not necessarily the first thing that come to mind. But look a little deeper, and you’ll realize that not only were these one of GM’s most successful designs of the period, they were also one of the out-of-the-box GM cars of the 1960s (along with the Corvair, Tempest, and more), and being American, were only available with an automatic transmission. Conveniently, they’re also back in style with the influence of Mad Men on our aesthetic sensibilities. 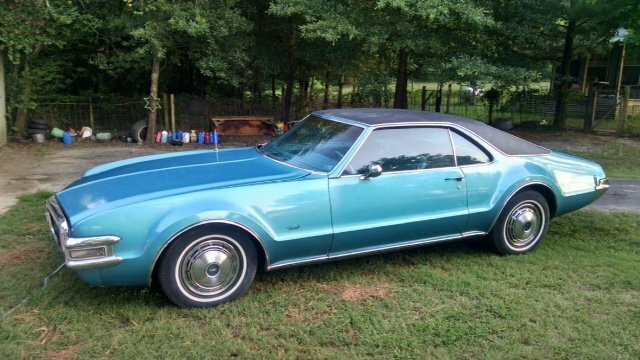 Check out this 1968 Oldsmobile Toronado for sale for $4500 in Winnsboro, TX. Light blue metallic paint works well on cars of this era, and seems to be in decent shape. The car is said to run and drive, but to need some work, including to the horn and headlight doors. Power windows and seats, as well as the original AM radio, are said to be functional. More detail is not provided, so let’s fantasize about working out the 375hp/510 lb.-ft. 7.5-liter V8. Those are likely gross numbers, but the ’66 with its slightly smaller 7-liter could hit 60 in 7.5 seconds, very respectable for a large personal luxury boat of about 4500 lb. This 3/4 rear view has to be the most appealing, with its sharply sloped rear deck, protruding fender flares with flat faces – something you see on many modern cars today. The vinyl top is the only negative here, as it takes away from the car’s clean lines. Note the AMC Pacer wagon in the background – the seller certainly has unusual tastes. The “luxury” hubcaps were not as attractive as the Cord-inspired steel wheels with partial hubcaps as seen on the early cars, but they are correct for the year. Fortunately, later cars also benefit from the vented disc brakes GM specified to address fading on the 1966-model 11″ drums. What can be seen of the interior shows clean velour seating (likely not original, as the upholstery probably matched the vinyl door panels) and everything else seemingly present and accounted for. You won’t have to make any excuses to your family about tears in the seats, and hopefully the luxury features the seller didn’t mention are functioning properly. The nearly flat floor will allow you to bring along five of your favorite people, and the automatic means anyone can drive it, provided they’re ready for all that torque going through the front wheels. Can’t wait to see the next classic to lure your unsuspecting family into the hobby? Sign up for email updates and they’ll reach you right when they’re published. This entry was posted on October 5, 2015 at 9:47 pm and is filed under Feature. You can follow any responses to this entry through the RSS 2.0 feed. You can leave a response, or trackback from your own site.